A single anchorage point, resp. anchor, represents an individual fall arrest system used on a roof, facade or other structure. It can either be used as a retention or as a fall arrest solution. 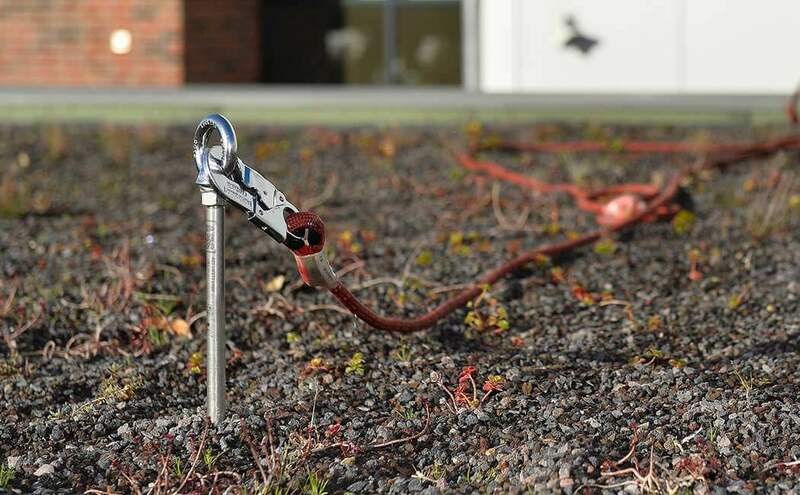 Anchorage points / anchors belong to the category of individual fall arrest solutions because they specifically protect individuals that have been specially trained to used personal fall protection equipment (PPE). Anchorage points offer a standard solution for securing a roof surface - but are also used in a range of different industrial applications, such as on crane ways, large machines and production lines. Users can connect themselves, resp. their safety harness connectors, up to these single anchorage points / anchors which are generally equipped with an anchorage eyelet or tab to which a carabiner hook can be attached (in accordance with EN 362). Depending on the application, this type of safety device can either by used to keep the worker at a safe distance from the falling edge to prevent a fall (retention system) or to catch an individual should he/she fall to prevent him/her from hitting the ground, which could be fatal (arresting system).